Are you stressed, tired in the middle of your semester? Imagine your classrooms, campus, students not even sure if they have water, electricity, food, much less internet, just because the place they live was twice in the path of hurricanes. Imagine you are a citizen of the United States of America and hear its leader blame you for this problem, and not delivering a fraction of the aid seen in Texas and Florida. Imagine your syllabus when, as university professor teacher, your are hoping just to contact students, and figure out how to continue classes. Like several of my colleagues, I have been very worried about our friend, colleague Antonio Vantaggiato (@avunque), and relieved when he was finally able to message us that he was okay. Frustrated. Friends fleeing. Power authority says nothing on when service reestablished (3 weeks off now) and LTE from AT&T is snail-slow. Antonio has been a generous soul in our field, arranging for me a slot at the TEDx event he organized plus a month long fellowship he arranged for me at Universidad del Sagrado Corazon. I don’t think he bumped into Zuck’s avatar. A few people have been asking how we can help, and Antonio is working to come up with some needs and suggestions. 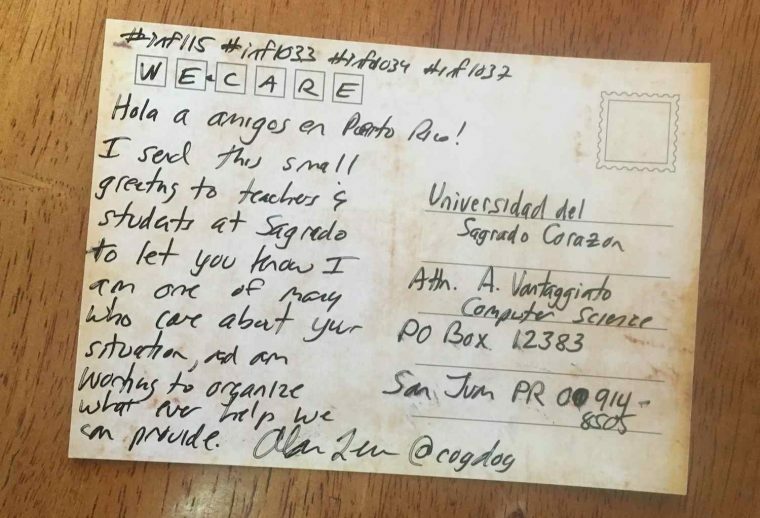 As a very small thing I thought we could do now, I suggested we start a campaign of mailing postcards to he and his students just to say, that unlike our President…. we care. It’s really simple. Do you know what the postage is to mail to Puerto Rico? Easy, the same as mailing something to me in Arizona or some clown in Washington DC. You seek, Puerto Rico is in the United States of America (someone mail that to the clown). That is 34 cents to mail from the USA to the USA. We will plan a DS106 Daily Create on Wednesday October 18 as another way to send a message of care. These are small, but as Antonio and his university develop their continuation plans, we will wait until he can share some more specific needs of his students. In my month in Puerto Rico, I experienced an overwhelming amount of friendliness, generosity, and spirit despite what were challenging conditions before the Hurricane. And I am horrified by the tone and lack of empathy our President is sending out; he does not speak for me. I’d like to think a pile of postcards might let our friends and fellow US citizens in Puerto Rico know that others feel like me. As I was scrambling to find a first card to send, I ony had a few left from some old movie postcards I bought last year. 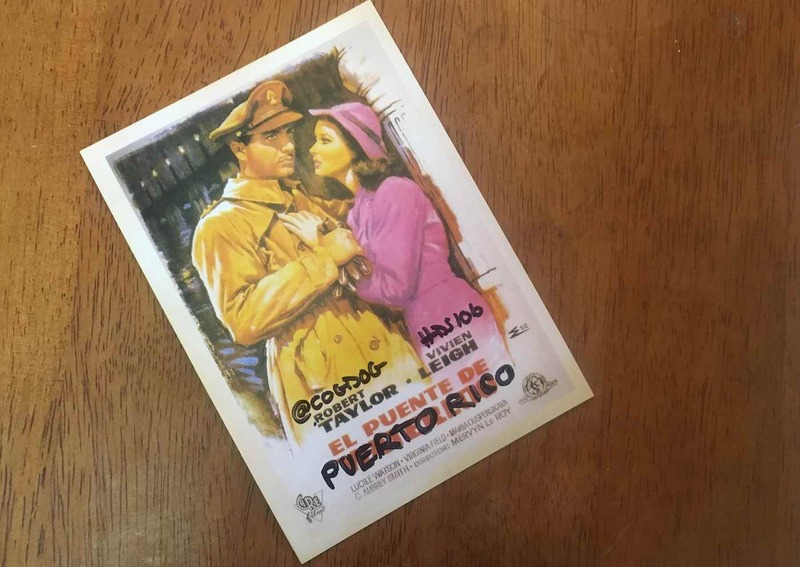 But the one I did pull was for the movie El Puente de Waterloo (The Waterloo Bridge) — so with some editing via Sharpee pen, I want to declare it as part of a Bridge of Care to Puerto Rico. We have a terrible president. Ten Years Between Blog Posts?